To the untrained eye, it was a honeycomb. The chambers, used by the honey bee to store amber sweetness, were merely a poor replica, made from paper. Wasps, you see, once lived here, hatching their offspring. Abandoned now, it is a hollow cast off, waiting for the river to carry it away. I see all this at a glance, pondering the usefulness of this knowledge now; wrestling on a precipice of my own making. One foot in the river, I let go, drawn into the channel like the paper wasp’s nest. Empty, alone, caving in on myself, spinning slowly downstream. This entry was posted in Flash Friday Fiction, Nature and tagged flash friday fiction. Bookmark the permalink. The narrator sounds to have reached a crisis in his or her life. Nicely done. 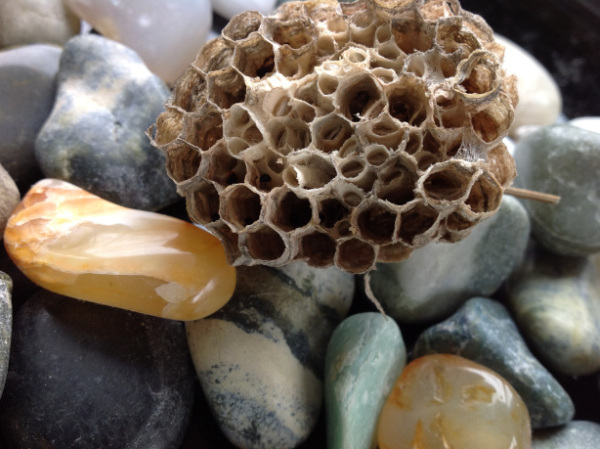 A haunting analogy between the narrator’s life and the empty wasp nest. Nicely done. I think we’ve all felt that empty, hollow feeling from time to time. You captured it well. You captured her feeling of hopelessness and hollowness very well, Erin. I know I’m pinching from Rochelle here, but ‘haunting’ describes your piece so well for me, Erin. Very touching, and sad, and beautifully written. A moment of clarity swallowed up in (what sounds like) depression… well written. How sad to be in that final, “empty nest” suicidal state. Well done. Helplessness is paralyzing when there seems no way out. Well done Erin! Nice look at a moment of clarity right before the point of no return.